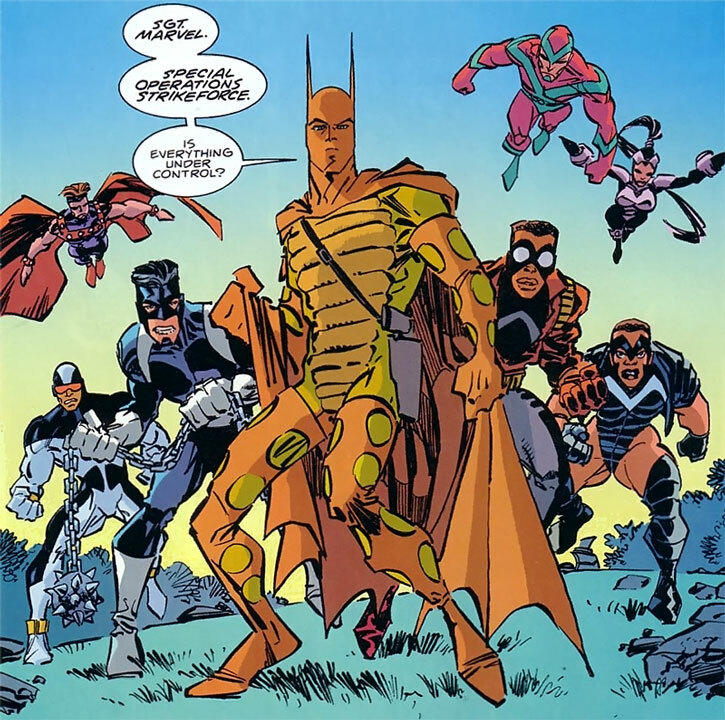 Sergeant Marvel is an odd Batman pastiche in the Savage Dragon books. He first appeared in 1997. The God Gun and the God Sword are good enough reasons to introduce Sgt. Marvel ! Other Aliases: John Marvel, The World’s Greatest Detective, Batman. Marital Status: Married (likely widowed). Known Relatives: Jill August (daughter, aka Dart, deceased), Alison Summers (granddaughter, aka Dart II). Base Of Operations: Detroit, and later Washington. Height: 6’4” Weight: 245 lbs. Marvel is not only a superior physical fighter, but also a sound tactician and a good strategist. While an excellent trainer his methods may be too limited. A unit that he trained can only function with him as their leader. Still, the S.O.S. greatly benefits from his dedication and experience and Marvel is an asset to work with under the right circumstances. Marvel is also a detective possibly known all over the world for his sharp intellect. This is is one of his most formidable assets. A good strategy will often save the day! The God Gun can grant any wish desired upon firing it, through magical means. But it only has a total of three shots per user. The latter likely is something Marvel doesn’t know. He likely believes that the gun has three shots in total. According to the rumours it can raise the dead, save the world, anything. Marvel has already used up two of his shots. Once he will have used up the third shot it won’t function for him any longer. While he never got a chance to use it in the books, he could use his last shot in a game. Marvel carries this in a gun holster around his chest, somewhat covered and protected by his cloak. This is because it may be required to save the world, and because it’s much too dangerous to safeguard anywhere else. After Marvel’s death the gun was stolen by Mr. Glum who then used it to take over the world. 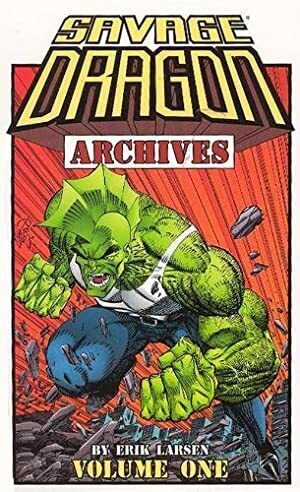 It was finally destroyed by the Savage Dragon, just as Mr. Glum was using his second shot. This eradicated the effect of all wishes done by all previous users. The God Sword, somewhat similar to a katana, can effortlessly cut through any known substance. That supposedly includes force fields. Marvel himself never used the sword in field, considering it much to dangerous. He kept it locked in a safe in his manor. After Marvel’s death the sword was stolen and used by his niece, the second Dart, until Dragon could again retrieve it for safe storage. Sgt. John Marvel served as a decorated superhero in the Việt Nam War. After the war he continued on as the leader of a covert group of superheroes working for the United States Government. Over the decades (perhaps even before the War) he obtained two extremely powerful artefacts. These were the God Gun which could fulfil any wish when fired, and the God Sword which can cut anything. He partnered up with the alien Solar Man during the 1970s. That lasted until Solar Man decided to eliminate all crime everywhere by ruthlessly starting to kill all criminals. During this mayhem Solar Man murdered Marvel’s lover, the superheroine Tiger. 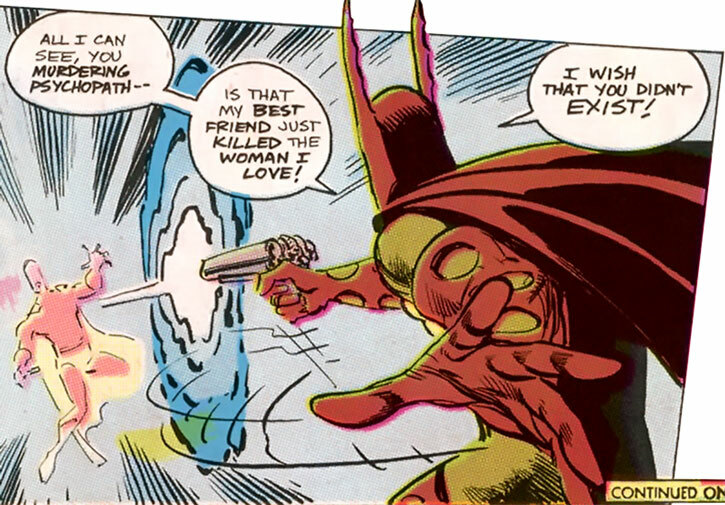 The global threat of Solar Man ended when Marvel used the God Gun. He wished it to remove Solar Man from existence and to resurrect Tiger. In the 1990s the government created the Special Operations Strikeforce (S.O.S.). Marvel was brought in as a trainer alongside Tiger. When a branch of the S.O.S. 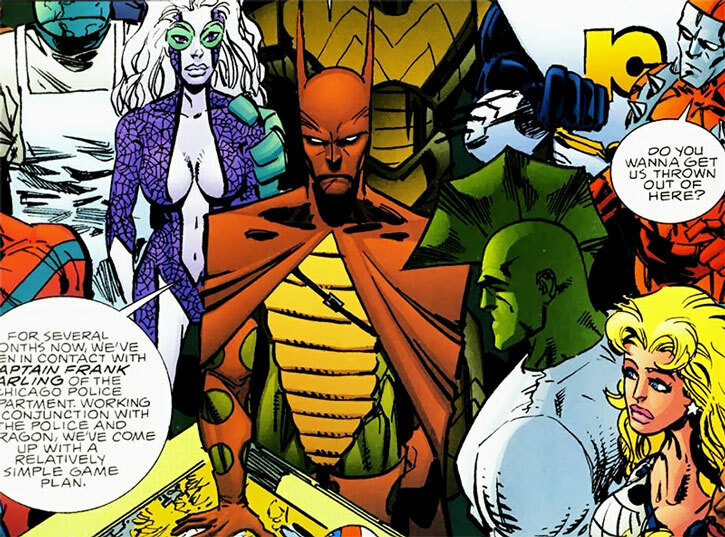 was opened in the Savage Dragon’s turf of Chicago Marvel was made the leader of that department. This worked out reasonably well until CyberFace took over the entire world one year later. After the Savage Dragon liberated the world Marvel continued as the leader of S.O.S.. But the Vicious Circle grew into a powerful threat again. Thus, Marvel ordered a S.O.S. attack on their hideout in Gaylord Manor. A lot of heroes died during the assault due to unforeseen circumstances. Marvel himself was killed by his own granddaughter, Dart II, who thus turned against a longstanding heroic tradition. Furthermore, Dart II then stole the God Sword. She joined the Vicious Circle as a superbly trained martial artist with an enormously powerful weapon. The God Gun was picked up from the ruins of the manor some time later by the extra-dimensional alien Mr. Glum, who used it to take over the world. Marvel’s legacy is a relatively well-trained S.O.S. unit. But it would prove unable to operate without his commands. Still, S.O.S. still exists to this day as a somewhat useful government superhero unit. 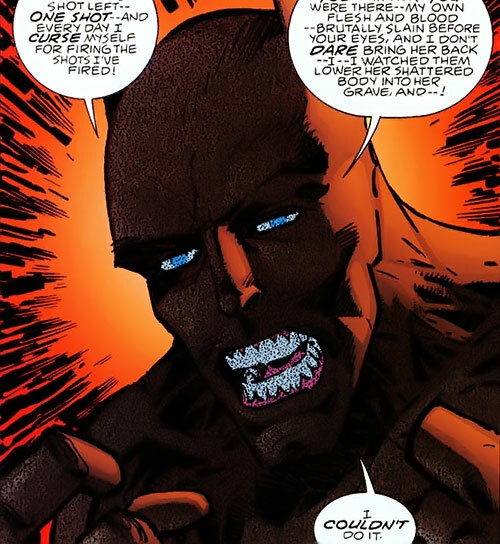 Solar Man would later return to plague the planet when the God Gun was destroyed by the Savage Dragon. This had cancelled all previously done wishes. Solar Man would, however, save the planet by stopping the all-powerful alien named Universo before the Savage Dragon would accidentally kill him. As such, Marvel has actually indirectly been a key character to the continued survival of the planet in several ways. Sgt. Marvel is a tall and muscular man. He wears an odd crime-fighting uniform in grey, yellow and brown colors. His legs and arms are covered by grey spandex, the legs are further covered by holed brownish, uh, something, and similar pieces are worn as gloves. His torso and stomach is covered by a sort of yellow padded armor. His head and shoulders are covered by a large brown cape and mask in Batman-style complete with large Batarang-like ears. The amazing God Gun in a black and blue holster can be seen on his chest peaking out from under the cape. His eyepieces are completely white, adding hard mystique to his odd looks. Sgt. Marvel is a legendary crime-fighter. While perhaps loosely modelled on the Batman, Sgt. Marvel is not the Batman. He is driven, disciplined, dedicated, adaptive and very well trained. But he does follow routines and the law, even to excesses which does not fit well with the Savage Dragon. On some level he seems the type to willingly sacrifice his own chances of a happy life because he is so driven to pursue justice. Naturally, he likes to work in organizational structures and follows jurisdiction and command structures to the letter. These things make him a good leader, although a bit unwilling to compromise. Hard work, dedication and a strong intellect no doubt also brought him the vast fortune that he is known to have. Marvel also has the responsibility of carrying and responsibly using the most powerful artefacts in human history. This responsibility weighs heavy upon him. Other superheroes are aware of him having the God Gun and the God Sword and they know what these artefacts can do. They wonder what it would take for him to fire the gun’s last shot. It’s clear that it would take something akin to the end of the world itself to do so. He sometimes wonders if he has used the artefacts wisely so far. He often finds that he has been far too egoistical in its use, but remains ready to use them only for the greater good, ignoring personal wishes. Well, in the DC Universe Sgt. Marvel is the Batman. Int: 08 Wil: 09 Min: 08 Occupation: Businessman, Vigilante, Head of the S.O.S. Use of Blitz Subskill applies to the newbie superheroes of his personally trained S.O.S. team. It seems conceivable that Marvel also regularly used Heavy weapons and Firearms during the Việt Nam War, in which case he would also have these Weaponry skills. He likely still retains some Connections with the U.S. Army. Expertise (Business, Tactics, Training), Leadership, Lightning Reflexes. The Chicago Police (Low), The Special Operations Strikeforce (High), Tiger (High). Guilt (The use of the God Gun and the responsibility of wise usage), Secret Identity. The God Sword [BODY 10, EV 06, Sharpness (EV): 22, Bonus: Force-rending (+25BC)]. The Physical RV of most targets will be reduced down to the minimum 04 APs by its Sharpness power, after which the killing, debilitating or incapacitating damage is applied. Writeup completed on the 9th of October, 2013.